Nums: More Millennials still living with parents … huh? A recent Pew survey has captured a lot of headlines claiming that an increasing percentage and number of Millennials to move back with mom and dad due to the bad economy, rising college enrollments and declining marriage rates. The headlines are technically true but, in my opinion, are very misleading. 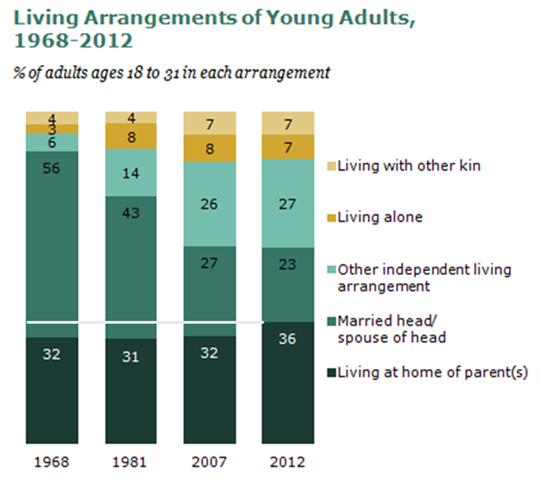 Note that the percentage of young adults living at home has stayed relatively constant – about 1 out of 3 — for the past 45 years. And, college students who live away from home in dorms for 9 months are counted as living at home. More kids are going to college, and they’re counted as boomerangs. Also note that over the same time period, the percentage classified as “married head of household or married to head of household” has dropped 33 percentage points to 23%. Now, that’s a seismic shift ! And, that shift is largely offset by the 21 percentage point increase in the “other independent living” category. When folks don’t get married, they don’t live with their spouses. Bottom line: This is more about the declining marriage rate than it is about junior boomeranging back home. This entry was posted on August 6, 2013 at 6:59 am and is filed under Demograhics, Millennials, Polls & Surveys. You can follow any responses to this entry through the RSS 2.0 feed. You can leave a response, or trackback from your own site.